Reminiscent of its DSLRs in design, it is the first in the series to adopt a built-in electronic viewfinder with 2.36M-dot OLED display. With twin-command dials, as well as both mode and exposure compensation dials, it also features a much higher level of control than previously seen in the M-series. Add continuous shooting up to 9 fps (7 fps with C-AF) and digital 5-axis image stabilization (in conjunction with in-lens IS) during video capture, plus the inevitable Wi-Fi and Bluetooth connectivity, and you have a compelling addition to the lineup. 9 fps continuous shooting (7 fps in continuous AF). 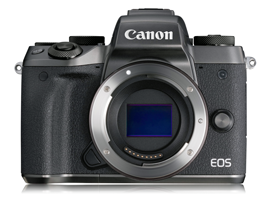 In our benchmarking, the Canon EOS M5 achieves a decent overall score of 77 points. Dynamic range is very good with a high 12.5 EV at base, of course, while achieving good balance in color depth at 23.4 bits and a low-light score of 1262 ISO, which while good, is still a little behind the better-performing sensors in APS-C format. While the performance is mostly unchanged from previous models using a similar sensor, it’s still very good overall. Against the EOS M3, the newer sensor in the EOS M5 has a little extra color depth throughout the ISO range, but mostly at base (of course), where noise is lowest. Besides suggesting slightly lower noise levels between the two sensors, higher color sensitivity is a useful attribute, in which improved color discrimination can potentially be seen in areas such as the roll-off in highlights at base. Similarly, the wider dynamic range, equating to +0.6EV at base, makes the EOS M5 files more malleable in post-production, allowing for a slightly improved experience when lifting shadows. However, with a negligible +0.125 stop difference in our low-light scores, there’s really no difference in the low-light capabilities of the two models. As the sensor is most likely the same as that in the Canon EOS 80D, it’s not surprising the scores are very similar overall; but the slightly different metric scores make it look as if Canon has tweaked the performance a little. We’ve also compared the M5 with the Sony A6300, one of the APS-C format models with class-leading sensor performance. 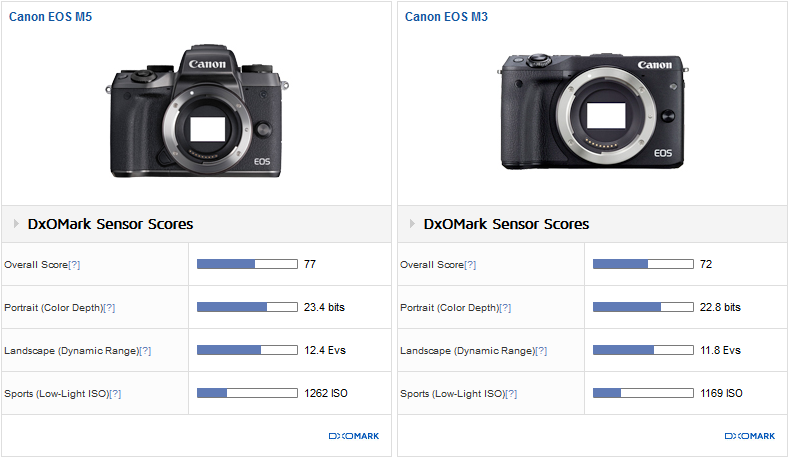 Despite the different sensor design, the EOS M5 (and Canon EOS 80D) are closer in performance than the figures might suggest. As you would expect, all three share excellent low noise characteristics at base ISO around the 42dB mark. Naturally, noise increases as gain is applied, with the M5 dropping to around 36 dB at ISO 400 (manufacturer) — still very good and only just behind the class-leading Sony. Noise levels start to become an issue in RAW images with higher ISOs. At ISO1600 (manufacturer), our 32dB threshold is breached, but it’s still on par with the Sony A6300. Against the Sony’s good low-light capabilities, the EOS M5 struggles a little with dynamic range. It’s also behind the EOS 80D by close to a stop (0.8EV) at base, though it’s not clear why this would be so and is surprising, given that the models are targeting a similar audience. The Sony is well ahead, however, with close to a stop and half (+1.3EV) wider exposure range at base, keeps that lead throughout the ISO range. It is this capability that gives the Sony a practical advantage in shooting under difficult lighting conditions — for example, with contre-jour or heavily back-lit scenes, even at higher ISOs. Nevertheless, the M5 maintains what we consider to be an excellent dynamic range of at least 10EV at up to ISO1600 (manufacturer). Color sensitivity is much the same between the EOS M5 and 80D. The M5 maintains excellent color depth up to ISO 400, and only just dips beneath the 20-bit level at ISO 800. However, the Sony maintains around a stop advantage up to ISO 1600, and continues to offer slightly better color discrimination at higher settings. At low to mid-ISOs, the M5 returns some excellent results up to ISO 800-1200 in RAW. Above that, it will still yield good image quality, especially when using some shadow recovery and noise reduction in post-production software. On paper, the M5 looks like a mini-EOS 80D; however, that’s not quite the case. The built-in electronic viewfinder, the additional controls, and 7 fps burst with continuous AF (9 fps with AF locked) are all welcome additions. Taken together with the 24.2-MP Dual Pixel AF CMOS sensor and Digital IS, it all signals Canon’s intention to compete more seriously with rivals in the mirrorless segment. With hindsight, it seems like the Dual Pixel AF CMOS was designed with mirrorless in mind. Image quality is similar to that of the sensor found on the EOS 80D.